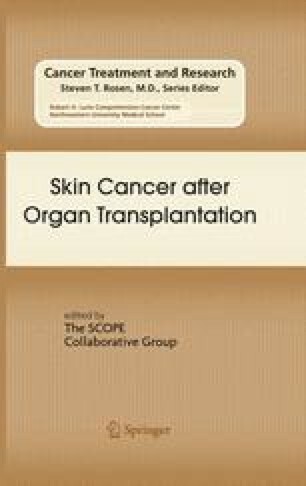 In contrast with cutaneous squamous cell carcinomas, the risk for development of melanoma does not appear to be greatly increased after solid organ transplantation, except for the rare case of donor-derived melanoma. The clinical aspects of melanoma in organ transplant recipients are discussed elsewhere, but it would seem that genetic susceptibility to melanoma is likely to be of similar relevance to the immunosuppressed individual as to the immunocompetent individual. Because the outcome of melanoma, particularly thicker melanomas, is worse after transplantation (Matin et al., in press), patients who come from melanoma-prone families or who have a history of multiple melanomas must be carefully counselled before transplantation. Extremely close skin surveillance and a low threshold for biopsy of melanocytic lesions would be advisable. Newton Bishop JA, Bishop DT. The genetics of susceptibility to cutaneous melanoma. Drugs Today (Barc) 2005;41(3):193–203. Available from http://www.ncbi.nlm.nih.gov/ entrez/query.fcgi?cmd=Retrieve&db=PubMed&dopt=Citation& list_uids=15883616. Molven A, Grimstvedt MB, Steine SJ, Harland M, Avril MF, Hayward NK, et al. A large Norwegian family with inherited malignant melanoma, multiple atypical nevi, and CDK4 mutation. Genes Chromosomes Cancer 2005; 44(1):10–8. Available from http://www.ncbi.nlm.nih.gov/entrez/query.fcgi?cmd=Retrieve&db=PubMed&dopt=Citation&list_uids=15880589. Chaudru V, Laud K, Avril MF, Miniere A, Chompret A, Bressac-de Paillerets B, et al. Melanocortin-1 receptor (MC1R) gene variants and dysplastic nevi modify penetrance of CDKN2A mutations in French melanoma-prone pedigrees. Cancer Epidemiol Biomarkers Prev 2005; 14(10):2384–90. Available from http://www.ncbi.nlm.nih.gov/ entrez/query.fcgi?cmd=Retrieve&db=PubMed&dopt=Citation&list_uids=16214921. Ringholm A, Klovins J, Rudzish R, Phillips S, Rees JL, Schioth HB. Pharmacological characterization of loss of function mutations of the human melanocortin 1 receptor that are associated with red hair. J Invest Dermatol 2004; 123(5):917–23. Available from http://www.ncbi.nlm.nih.gov/entrez/query.fcgi?cmd=Retrieve&db=PubMed&dopt=Citation &list_uids=15482480. Kennedy C, ter Huurne J, Berkhout M, Gruis N, Bastiaens M, Bergman W, et al. Melanocortin 1 receptor (MC1R) gene variants are associated with an increased risk for cutaneous melanoma which is largely independent of skin type and hair color. J Invest Dermatol 2001; 117(2):294–300. Available from http://www.ncbi.nlm.nih.gov/ entrez/query.fcgi?cmd=Retrieve&db=PubMed&dopt=Citation&list_uids=11511307. Matichard E, Verpillat P, Meziani R, Gerard B, Descamps V, Legroux E, et al. Melanocortin 1 receptor (MC1R) gene variants may increase the risk of melanoma in France independently of clinical risk factors and UV exposure. J Med Genet 2004; 41(2):e13. Available from http://www.ncbi.nlm.nih.gov/entrez/query.fcgi?cmd=Retrieve&db=PubMed&dopt=Citation &list_uids=14757863. Stratigos AJ, Dimisianos G, Nikolaou V, Poulou M, Sypsa V, Stefanaki I, et al. Melanocortin receptor-1 gene polymorphisms and the risk of cutaneous melanoma in a low-risk southern European population. J Invest Dermatol 2006; 126: 1842–1849. Available from http://www.ncbi.nlm.nih.gov/entrez/query.fcgi?cmd=Retrieve&db=PubMed&dopt= Citation&list_uids=16601669. Li C, Larson D, Zhang Z, Liu Z, Strom SS, Gershenwald JE, et al. Polymorphisms of the FAS and FAS ligand genes associated with risk of cutaneous malignant melanoma. Pharmacogenet Genomics 2006; 16(4):253–63. Available from http://www.ncbi.nlm.nih.gov/entrez/query.fcgi?cmd=Retrieve&db=PubMed&dopt=Citation&list_uids=16538172.